Who was that veiled woman? 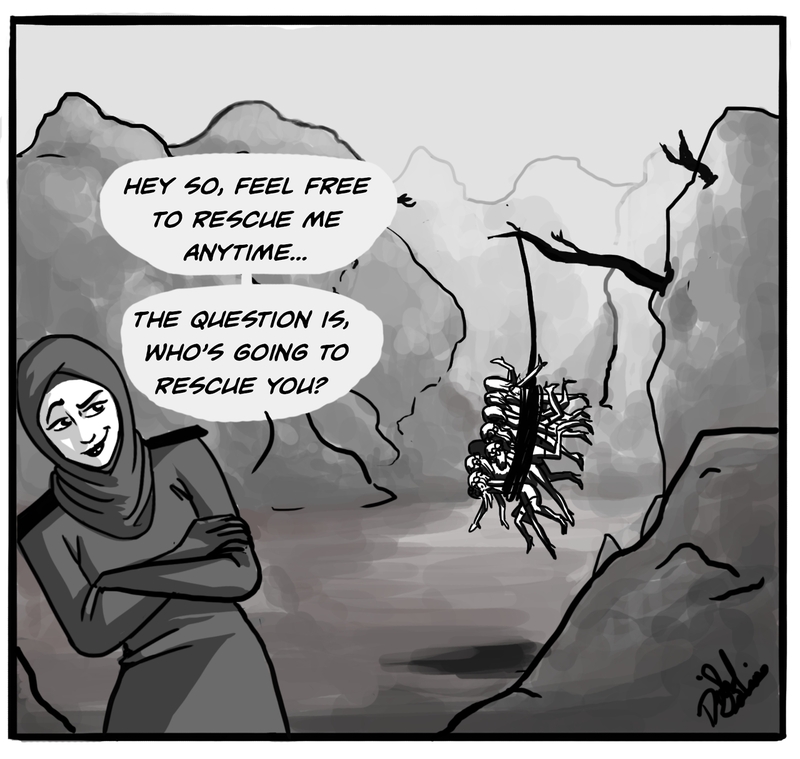 It’s Qahera, the hijabi superhero, and misogynists and Islamic-bashing Western feminists had better head for the hills. Born of the Arab Spring and created by an Egyptian blogger and artist called Deena, Qahera’s popularity is growing in the Middle East. 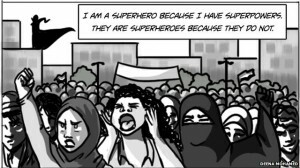 While initially the audience consisted of Muslim girls who could relate to Qahera, fans have come to include girls from around the world, as well as comics buffs. In one of the comics, Qahera swoops in to save a woman from a gang of men who are harassing her. 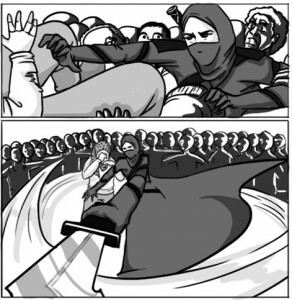 In another, she attacks a group of Femen women who claim Qahera’s hijab is keeping her from being a free woman. All perpetrators end up dangling awkwardly from poles that line the streets, alive but humiliated. 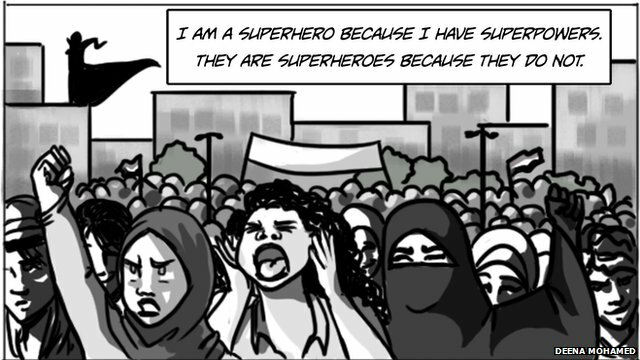 Our superhero was born into a time when Egyptian women—and men, though they may not know it—seem to need her most. Sexual harassment rates in Egypt are staggeringly high. According to a 2008 survey done by the Egyptian Center for Women’s Rights, 83 percent of Egyptian women reported experiencing sexual harassment at least once, and nearly half of the women said they experience it daily. And 98 percent of the foreign women surveyed reported similar treatment in Egypt. Wearing a veil did not appear to lessen a woman’s chances of being harassed. 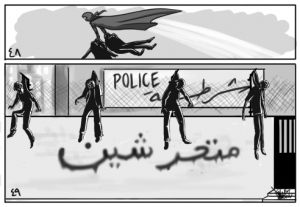 About 62 percent of Egyptian men admitted to perpetrating harassment. Qahera isn’t just proud of being a woman. She’s proud of being a Muslim woman. She doesn’t just battle male pigs but also Islamophobia, which has at times led to violent acts against Muslims throughout the world. So who is Deena, the woman who drew the sword into Qahera’s skillful, animated hands? “Hello! I’m a generally unremarkable Muslim Egyptian female who currently resides within the land of many protests and pyramids,” is how Deena introduces herself in her Tumblr blog. In an interview with Vocativ, she says she’s just a “boring artist” and wanted her work, not her, to be in the spotlight. Deena’s self-designed blog, which is called I Don’t Really Blog Like An Egyptian, could easily be mistaken for one belonging to an American girl. There’s chocolate, Monty Python and even commentary on Breaking Bad; but there’s also personal opinions on Islam and Egypt, as well as a certain hijab-wearing superhero. And while she does get an occasional message of hatred or prejudice, overall there has been surprisingly little backlash. As for the high rates of sexual harassment in Egypt, Deena both criticizes and defends her country. 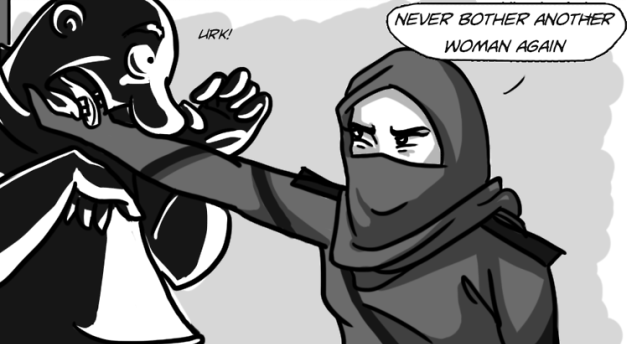 “Sexual harassment is definitely a major issue in Egypt. But when I say that, it feels like ti gives a lot of people the freedom to point the finger at the ‘developing’ Muslim or Arab country and forget that harassment is a worldwide problem,” she clarifies. Perhaps unbeknownst to both Deena and her heroic brainchild, Qahera is fighting not just for women and Muslims, but also for the equal portrayal of women in comics as a whole. 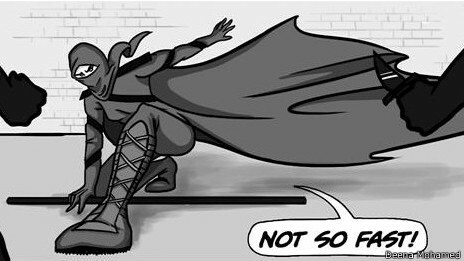 In these comics, a woman can be strong and inspiring without a clothing limit or even a touch of seduction. And maybe one of these days, women will be able to walk through the streets—of Egypt or other hostile zones—without fear. Until then, Qahera will be watching. Idiots don’t have sane reasons benoyd “it felt good, man!”, however that translates into Arabic.But your right, how this can help Egypt’s fledgling democracy…But then Jews have been a convenient target for, lo, these many centuries.The idiots clearly don’t realise that if they’d ignore for the past two millenia, there wouldn’t _be_ any Jews. It’s _there_ persecution that aloowed us to collectively survive. Might as well be hung for a sheep as for as for a lamb. I’m blowed if I’m going to do any “as-a-Jew” tricks just for their satisfaction.Heavens, I’m gettoing aggressive these days!